I’ve raised money twice: $1 million for ExpressDoctors (a flop) and $350,000 for Mojam (which got sold and is still around!). I’m by no means a pro — you’ll find many others with more experience — but I don’t see too many of them writing about their experience. I enjoy sharing my learnings with others in hopes of creating more awesome businesses, non-profits or other organizations in our Universe! I’m leaving out the “Fundraising 101″ type tips such as: Define the uses of the money you need; investing takes longer than you think; have a good business plan, have a name-brand/or trustworthy bank and law firm to process paperwork, etc. — you can find those tips anywhere. My tips are, hopefully, a bit outside the box. Crafting an investor pipeline is an easy and effective way to help raise money. Some of the most successful products of all time began as something else — I love coaching entrepreneurs on this fact! The morale of the story is: get started on building your products because the sooner you get started, the sooner you’ll know what amazing product you can build! Two engineers, Marc Chavannes and Aldred Fielding, sealed two shower curtains together to create a new type of wallpaper (with bubbles in it). It was later marketed as greenhouse insulation. It wasn’t until years later that Bubble Wrap would be used to help protect IBM computers during shipping. BubbleWrap is also ranked #22 in my list of The Top 100 Brands Synonomous With Their Product Category. I love serendipity — who doesn’t? I met a mayoral candidate for San Francisco last year due to some stuff I did to increase serendipity. We all love serendipity — is it ever even a negative thing? The layman’s definition of serendipity is “happy accident” — the word serendipity is said to come from author Horace Walpole who riffed on the word Sernedip (an old name for Sri Lanka) used in a fairy tale called “The Three Princes Of Serendip” about making discoveries by accident. The most effective way to increase serendipity is to send out “beacons” — I first heard this mentioned by entrepreneur Jack Hidary in the book Power of Pull. Jack — who works on the neat iAmplify.com business with his brother Murray — uses the analogy of a ship at sea that sends out beacons to let others know where it is and where it’s headed. Beacons — I like that. I’ve met with about 75 CEOs since Halloween when I left my CEO role at Hot Topic Media to pursue new ventures. A good CEO must be able to provide a clear vision of what it is the organization is doing. Check out this List Of 50 Awesome Vision Statements I compiled. A good CEO masters the business model of an organization. A good CEO knows the answers to the 9 questions in the different sections of this "Canvas." 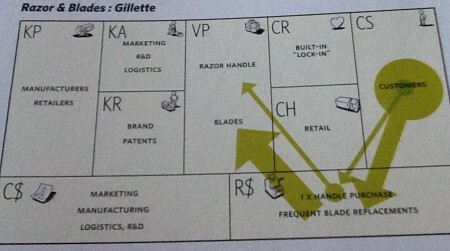 The above image is of a “Canvas” used to master a business model (in this case, Gillette’s) from the book Business Model Generation. The Canvas pushes you to answer 9 questions that are imperative to mastering how a business should work. The 9 questions to answer are represented above by a two letter acronym…such as KP for “Who are your Key Partnerships?”).